CEREBRATION 2017 is an IQ based challenge that aims at celebrating intellectual geniuses. 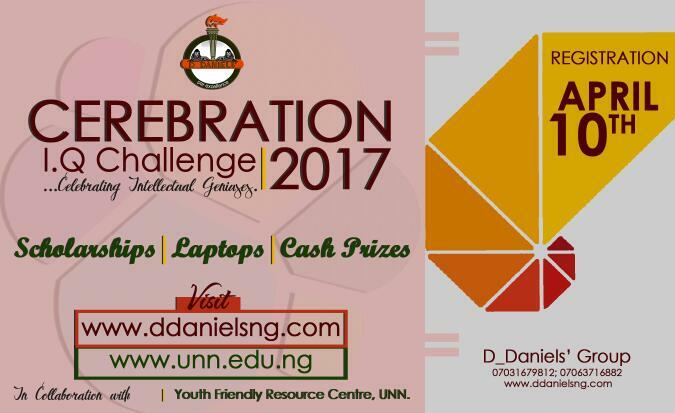 The IQ Challenge is proudly organised by D_Daniels' Group in partnership with the Youth Friendly Resource Centre, in search of UNNs greatest intellectual geniuses for the year 2017. The Challenge seeks to bridge the divide between academic proficiency and general intellectual sagacity. Thus, questions would range from areas such as brain teasers, spelling bee, interview-like questions, maze-like & jig-saw puzzles, real life situations poised questions, and general knowledge, with time and accuracy as the basic factors for grading the participants. Participants will be tested individually at the faculty level. Questions from this stage would be partly IQ-based and the rest would be disciplinary as set by their respective faculties. Participants who cross the cutoff grade qualify into the next stage. This is also expected to be a written IQ based quiz from which the best five from each faculty would qualify for the next stage, where they would be randomly arranged into teams (of five) for the next stage. In this stage, the various teams consisting of persons from varying faculties will compete against each other, from which the best four teams will be selected. This is the semi-final stage where the 20 people left will compete individually. From amongst these, the best five participants qualify as finalists. This is the final stage, where the five finalists get to compete for the ultimate prize. All undergraduates in all departments and faculties in the University of Nigeria (Nsukka and Enugu Campuses) are eligible to register. Interested participants may be in any level or class. • Winner goes home with a 3 year Scholarship (cash) + a laptop. • The first runner up goes with a 2 year Scholarship (cash). • The second runner up goes with a 1 year scholarship (cash). • All finalists gets a Medal of Honour. • All Faculty representatives (from stage 3) would receive Certificates of Participation. • Best Faculty award goes to the best faculty with outstanding participants. • upload proof of payment and complete the registration process. Registration started on Monday, April 10th, 2017.